Blair E. Cody, III was born and raised here in Catawba County. He graduated from Fred T. Foard High School where he was Captain of tigers football team. After high school he attended Lenoir-Rhyne University where he played football for the Bears. While he was at Lenoir-Rhyne, the Bears won the South Atlantic Conference Championship in 1994 and led the nation in numerous offensive categories. He was selected Captain of the Football team his senior season and was selected as an all-conference performer as well as a preseason academic All-American. Upon graduation, Blair attended law school at North Carolina Central University where he participated in moot court program, mock trial team and was selected by his peers as President of his law school class. Blair worked in the Durham county district attorney’s office under the third year practice rule prior to his last year of law school. Upon graduation, Blair moved back to Hickory and began practicing law. 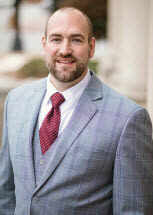 He worked for two law firms in Hickory prior to opening his own practice in January 2006. Blair is an active member of the North Carolina Advocates for Justice which is an organization of lawyers who represent the interests of ordinary people across North Carolina. “Some of the best lawyers I know are active in the NCAJ and it is so refreshing to see them giving back to people like myself by teaching and mentoring other lawyers”. Blair is also a member of the North Carolina Bar Association, Catawba County Bar, 25th Judicial District Bar. Nationally Blair is a member of the National Association of Criminal Defense Attorneys and the Association of Trial Lawyers of America. Blair is currently the President of the Piedmont Educational Foundation, more commonly known as the Bears’ Club for Lenoir-Rhyne Athletics. Blair has been a member of the PEF since returning to Hickory. The PEF is a non-profit organization that raises money for the sole purpose of funding athletic scholarships for young men and women at Lenoir-Rhyne University. Blair is also a member of Plateau United Methodist Church, which is located in Vale, NC. When Blair is not at the office, or working from home he truly enjoys spending time with his mother and father as well as his close friends. He enjoys any Lenoir-Rhyne athletic event, especially Bear football (4 Consecutive Conference championships in 2011,12,13 & 14!!) as well as physical exercise. He is a Corvette enthusiast and has owned a few over the years, although he is currently vette “less” he is looking! Doing everything in our power to eliminate the consequences of a criminal arrest.